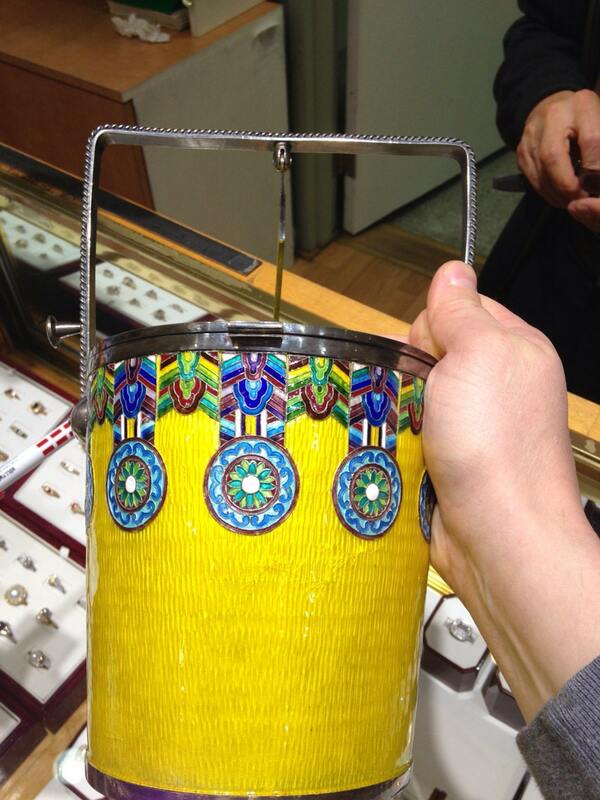 This is a large pair of ice buckets crafted entirely of 99% pure silver. 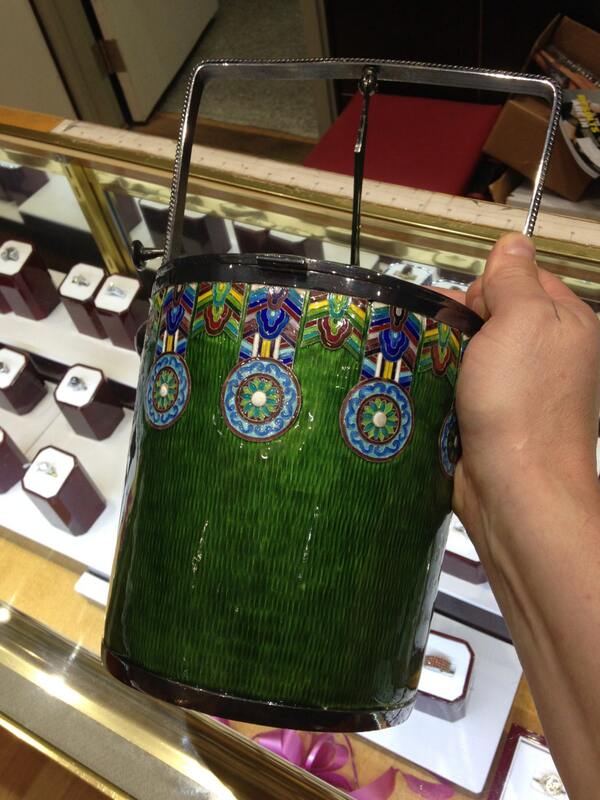 The silver has been deeply etched and then the buckets adorned with an overlay of explosive enamel. The rich colors include a background of imperial yellow, royal blue, turquoise, azure, grass green, mint, black, white, burgundy and so on. The buckets were turned on a lathe, and then hand finished with hand hammered pins and fittings as well as the hand etched fields. I cannot find another example of this in the world and was told they were a custom order in Korea by a wealthy businessman. The lid is on a hinge. It is also attached to the handle in such a way that when the handle is pushed, the lid opens and closes automatically-- and the two cannot be separated. 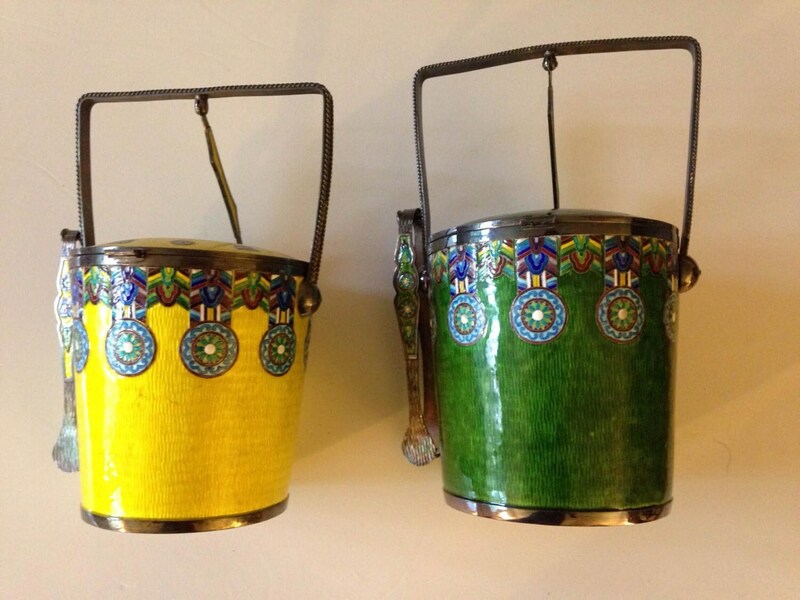 The parts of the handle mechanism and handle are inlaid with yellow/green enamel and the lid is adorned with a variety of inlaid shields and patterned circles. There is a knob on the handle from which to hang ice tongs which are present. Inside the bucket, there is an insert so that there is space for the water to run out of the melting ice to the catch basin below. The pieces are hallmarked "AG99", "Made in Korea", and "KHD" alongside a couple of symbols. Marks are the same on both. Condition is to be considered excellent with only one extremely minor loss to the enamel on the yellow one where the handle mechanism meets the lid. 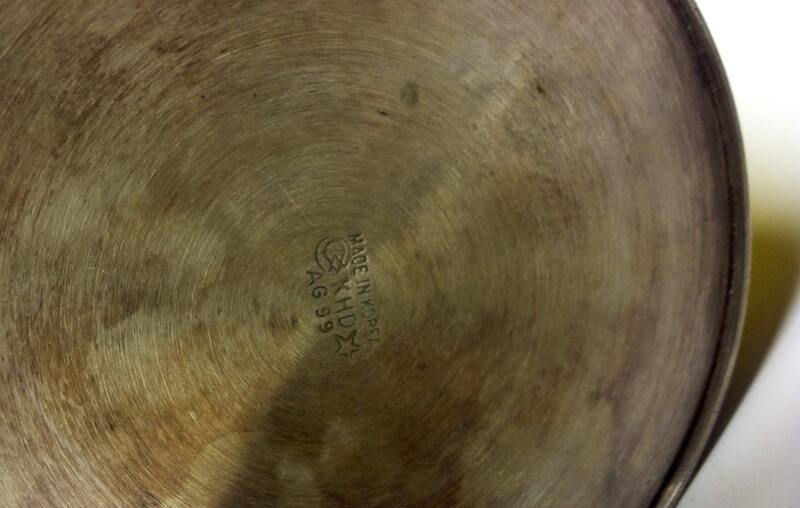 There are a couple of spots where the enamel shows minor cracking as shown. These cracks are both stable and subtle except on very close examination. The green bucket is perfect. 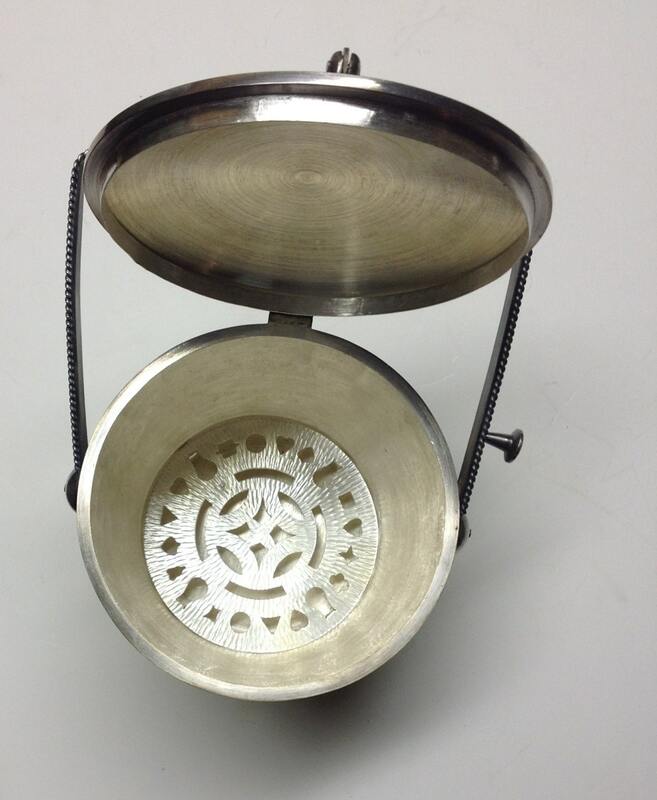 As always in my shop, silver content and quality are guaranteed. Ships fully insured with tracking. Shipping to South Korea is not a problem. Additional photos or QuickTime video available upon request. Dimensions: Yellow is 11" tall and 6.25" in diameter at the lid. Weight: 2 lbs, 7.2 Ounces or 1,185 grams. 이 전체 99 % 순수한은으로 제작 된 얼음 양동이의 큰 쌍이다. 실버 깊이 후 폭발 에나멜의 오버레이로 장식 된 버킷을 에칭하고있다. 풍부한 색상 등 제국 노란색, 감청색, 청록색, 푸른 잔디, 그린, 민트, 블랙, 화이트, 레드 와인과의 배경을 포함한다. 버킷은 선반에 설정 한 후, 손으로 핀 및 피팅뿐만 아니라 손 에칭 필드를 망치로 마무리 손입니다. 나는 세상이의 또 다른 예를 찾을 수 없습니다 그들은 부유 한 사업가가 한국에서 사용자 지정 순서를했다 들었다. 뚜껑은 힌지에 있습니다. 또한, 손잡이가 가압되는 경우, 상기 덮개가 열리고 automatically-- 폐쇄되는 방식으로 핸들에 부착되고, 두 개의 분리 될 수 없다. 핸들 메커니즘과 핸들의 부분은 노란색 / 녹색 에나멜 상감하고 뚜껑 상감 방패와 패턴 원의 다양한 장식되어 있습니다. 존재하는 얼음 집게를 중단 할 수있는 핸들의 손잡이가 있습니다. 물이 아래의 캐치 유역에 녹는 얼음이 부족 할 공간이되도록 버킷 내부 삽입이있다. 조각은 심볼의 몇 함께 "AG99", "한국에서 만든"및 "KHD"를 hallmarked됩니다. 마크는 모두 동일합니다. 조건은 손잡이기구는 덮개를 충족 노란색 하나의 멜 하나만 극히 작은 손실 우수한한다. 그림과 같이 에나멜 사소한 균열을 보여줍니다 명소 몇 가지 있습니다. 이러한 균열은 매우 정밀 검사 제외 안정과 미묘한 상표입니다. 녹색 버킷은 완벽합니다. 항상 내 가게에서와 같이,은 내용과 품질이 보장됩니다. 선박 완전히 추적과 보험. 한국으로 배송하는 것은 문제가되지 않습니다. 추가 사진 또는 요청시 QuickTime 비디오. 크기 : 노란색 뚜껑에 직경 11 "높이 6.25"입니다. 무게 : 2 파운드, 7.2 온스 또는 1,185g. 아니면 그냥 가게 주위에 찾아!